You are invited to a special celebration of the Air Line Trail license agreement between the Town of Portland and Eversource on Wednesday, January 20, at 7:30 p.m. at the Waverly Center, 7 Waverly Avenue in Portland. This license is a critical step toward the extension of the Air Line Trail into Portland, using property owned by Eversource. To mark this milestone, a special celebratory 4 mile hike on the trail, called “Freezin’ for a Reason,” will follow on Saturday, January 23 at 10 AM, starting from the YMCA Camp Ingersoll parking area. Portland began discussions with Eversource on the license agreement back in 2011, or even earlier. A major complication was the presence of the Algonquin Natural Gas pipeline, owned by Spectra Energy, which runs underground along the trail. Sorting out safety and liability issues among the parties was understandably complicated and time-consuming. But with the license agreement settled, the Town of Portland will have permission to repair and improve the historic rail bed for bicyclists and walkers. 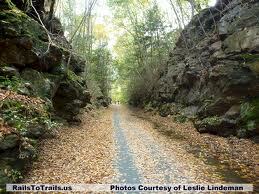 The Air Line Trail Steering Committee and the Town have applied for funding to begin actual repair work on the trail. Grant awards should be announced in the coming months. Note: Except for special events like the hike mentioned above, the Air Line Trail in Portland is still not yet open to the public for general, informal use. Some work needs to be done on it first.